This entry was posted on Wednesday, January 18th, 2006 at 19:19	and is filed under Planet Gnome, Software. You can follow any responses to this entry through the RSS 2.0 feed. Both comments and pings are currently closed. Happy to see the adoption of the tango style among the developer crowd. Yay! Récolter le fruit de son travail, c’est juste. Récolter le fruit du travail des autres, ça ne l’est pas. Tu pourrais peut-être employer ton énergie à autre chose que l’amélioration d’un outil à répandre la merde, non ? Hey! Great work with this new tool! This is great work, and I encourage you to continue it. I only wish I had time to help code. I can, however, help test, since I have to work with stocks on a daily basis anyway. I am not sure that it needs to be part of the gnome core, since I don’t know what percentage of users will use it, but I do encourage you to work and release a final version. Personally I use Fedora Core 4 (and FC5T1), and would be more than happy to test if there is an installable RPM. This is something that would be great in fedora-extras. graphs and quotes could be grabbed from several places. For example, clearstation.com has very good graphs, while some other places have quotes for more funds. pas mal du tout, continues. Cela marche aussi avec yahoo France et sur les sites des différentes places boursières européennes ? great applet, but it seems the make install didn’t get it to show up in the applets list. Any idea on how I can get it to show up so I can add the applet into the panel? Interesting…what made you think of this? The file ‘Invest_Applet.server’ has to be in the right directory, (/usr/lib/bonobo/servers/ for Ubuntu Dapper). Mine ended up in /usr/local/lib/bonobo/servers. A quick workaround is simply to move the file and the applet shows up in the applet chooser. I have just started stock trading in Singapore. Wish us success in snatching our wealth in our stock market! My blog is at http://stock-wealth.blogspot.com. Hope to C U there! Very cool applet – I use FC5, would love to see this end up in Extras or something, if not in GNOME itself.. This was the behaviour in stock ticker. Would be nice to have it back unless I’m missing something. 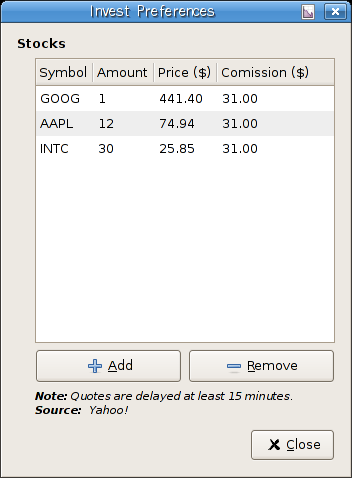 Is it possible that Invest will someday have ticker functionality? I just want to see a scrolling list of some basics, like the Dow, S&P, NASDAQ, etc. Maybe a few individual stocks. Or maybe not. I don’t care about a specific portfolio, I just want to see prices. Maybe that’s already supported. Is there any kind of documentation? I’ve been able to figure out how to change things in the portfolio editor, but it doesn’t seem to have any effect. The drop down on the panel doesn’t drop down, all that happens is that the arrow changes size briefly. 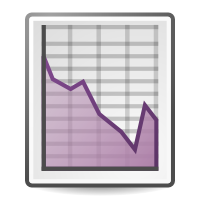 Is there any way to show graphs from the german financial yahoo web page. Basically I can see the stock price and the daily change, but cannot open the graph as the address is pointing to a wrong place. How can I edit this and change the address? Is there anyway to save the setting when viewing graphs? GOTTA SAY GREAT APPLET!!!!!!!!!!!!!!!! Nice applet! Is there a possibility to add support for other stock exchanges than american ones? I have just started using Invest today, and I like the expanded offerings that you have put in. There are some things that I think will take some time to get used to. I am a big investor as well as a developer, and I’m thinking about contributing to the project. I will check out the project website shortly. Hi, thanks so much for creating this, works wonderful on ubuntu. I just wondered is there a way how to change the defualt view for the graph? I have to change it all the time, the different indicators. [quote comment=”8390″]Is it possible that Invest will someday have ticker functionality? I just upgraded and now I’ve lost gtik and have no more scrolling ticker. 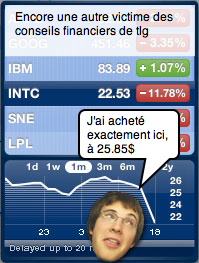 I like the graphs, but really miss my ticker! Hey, what about proxy support?!? Cool work. Nice tool , Can a I get a lookalike program for windows? I love the applet, but I would like to know what the different colors mean. (red and green are obvious). Hey, it seems that if i enter an “amount” in fedora 8, I get a blank popup window from the applet. If I leave the amounts as all zeros, I see the current value and percent change. One feature that I think would be nice, would be an option to specify the minimum percent change to show a colour change. Say if a stock hasn’t changed by more than .05%, the entry is shown as black, otherwise it is shown as green or red. I use Sharebuilder as my broker, and they allow me to buy fractional shares of stocks. For example, I own .54 shares of Google. When entering my stocks into Invest, i discovered that it will only accept whole numbers. I always find myself searching the web for sights with stock market news and free charts but I can’t find one simple site that gives all the info I want on one page so I can quickly see an over view of the market as well as news and stock charts, so I’m building a new web site for this purpose, I’ve just started working on this site so any advice would be approached. Here is what we call abrilliant idea of investing aplet. Thanks man. 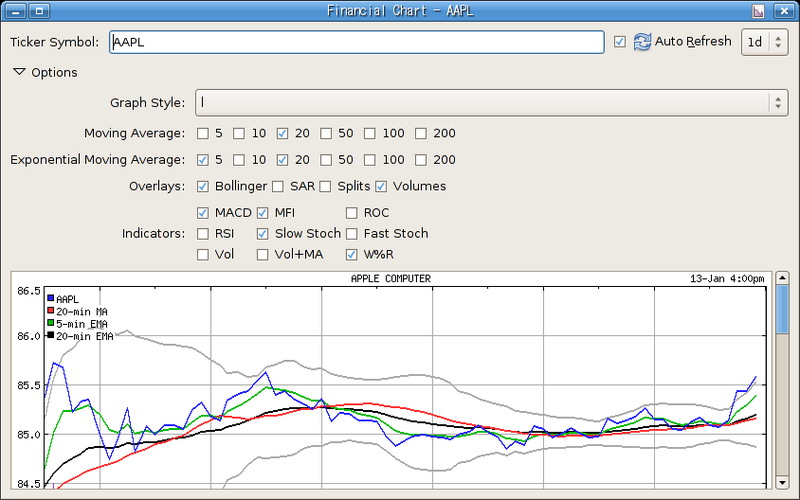 I can’t tell you how convenient your invest applet has enabled me to know what’s going on in the financial market. It’s also one of the reasons why I love Gnome. Nice app with one big feature missing: scrolling ticker! Also it could be nice to be able to configure update intervals. Is there a way we can include the prices of precious metals as well? As a developer I’d love to help if you could point me in the right direction. To find your symbol, go to Yahoo Finance, Menu “Investing”, “Market Stats” and then “Commodities/Futures”. You’ll find metals, oil and stuff there. Only trouble is that, since it’s futures, you’ll probably need to change the symbol every month or so. A great upgrade for it would be an alarm function, where a pop-up tells you when an stock increased more than an estimated value. Bug #1: The ‘average change’ in the tooltip is not the average at all, but in fact just the change of the first listed stock. Bug #2: Invest does not update quotes automatically at all. I am using it with a desktop with Mint 7 and it works fine. Great applet. always get only the message: “No stock quotes are currently available”. It seems there is a problem with connecting with the yahoo servers. I also have weather applets that connect to internet with no problem. 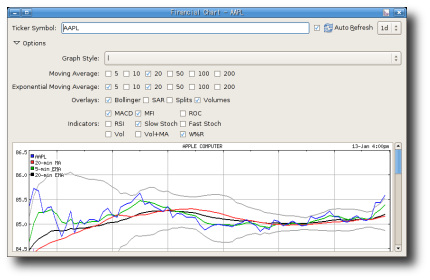 I appear to have found a bug in my version (2.24.3.1 according to the program info): When I’m trying to load the 3 year charts (“3y”), the program really displays the stock values for the last 3 months (“3m”). Is this already fixed for future releases? I’m using Invest 2.22.2. I love the applet, but I would like to know what the different colors mean. I love the app! Keep up the good work! I would second the scrolling ticker. Also would it be possible to see info from news articles/msg board? Looks good so far. Is it possible for the app to get quotes for stocks on non-US exchanges, such as the London Stock Exchange? If so, how should the symbol be specified? Thanks, very cool applet. I use it every day. When tracking Swiss stocks (i.e. HOLN.VX) the “mini” chart is scaled starting from 0. I assume Swiss quotes start with a value 0.00. Possible solution: Ignore quotes of value 0.00? How can I backup the portfolio if I want to move to another computer? It is very annoying to manually enter all codes every time I have to change to another computer. Suggestion: allow to export/import the portfolio to/from a csv file. exemple: Al.PA in France for “Air liquide” company. Inverst 2.22.3 doesn’t accept stock codes with one small letter. I presume that the symbol code is converted in capital letters. Great tool! I use the Invest 2.30.0 tool on a daily basis. A really nice addition would be to have currency and exchange rate included. Creating a list with stocks from several international stock exchanges results in a wrong position balance as each local currency is summed together without conversion to a common currency. Thanks, I use Invest 2.3 both at work & home computers. Would you please take a quick look at the URL, and tell me how much work that looks like (if you recognize the URL formatting, it similar or not) ?